The Ro-batt shield provides an all-in-one solution to Arduino™ based robotics projects. Batteries, motor drivers and servo connections are all on the one shield. The on-board 4xAA battery pack supplies the motor driver and servos directly. A boost convertor increases the battery voltage to supply the Arduino through the Vin pin; this means an Arduino with a Ro-batt shield can be safely plugged into the USB port while developing firmware. 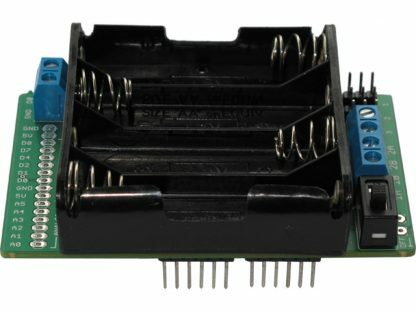 • Battery power, motor driver and servo connections on one shield: no need for a separate power supply for your project! 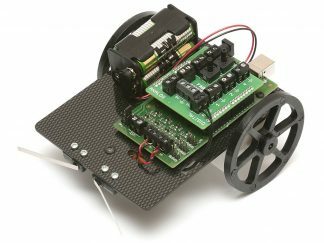 • Up to three servos can be connected using the on-board headers. • Two motors can be connected via terminal blocks. • Forward, reverse and PWM motor control is possible (maximum 1A per motor). • The on-board on-off switch will disconnect the batteries, saving power when not in use. • Pads are available to connect an external on-off switch. • A single terminal block provides an easy way to connect an input for simple projects. 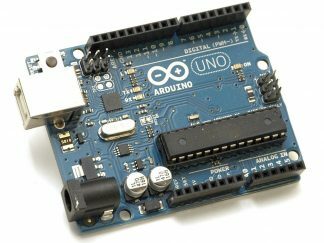 • Pads are also available for unused Arduino pins. • Designed to be compatible with the new version of Flowino software for easy programming of servos, motors etc. Also compatible with Arduino programming software. The version shipped may differ from the above photograph. See www.redfernelectronics.co.uk/ro-batt for more information.